The evolution continues! I got my Coyotes today and extracted the frames from the boots. The holes line up with my Seba skates! That was a big relief. There is a height differential between the rear mount and the front mount (sort of like a drop on a shoe). To get these to work I'm going to need to do two things: get longer bolts; and fab up a shim to fill in the gap at the front mount. Pretty psyched! There is a SUBSTANTIAL difference in overall massing of the two set ups as you can see in the attached picture. To the left is the Rollerblade Coyote set up with 150mm diameter wheels while on the right is the Powerslide Metropolis SUV setup with 125mm wheels. Next live action will be on the Ivanpah Playa in about 10 days at IBX. The smaller SUV setup should be fine for there as the surface is hard and (relatively) smooth. The Monster Truck rigging may become my go-to's for the long grass. Whupp! The funny thing to me about this picture is that it looks like one of those optical illusion photos. The boots of course are the same size but the one on the big wheels looks smaller! You created an illusion ,indeed. ...Plus looks like it's half levitating(front) on Coyote frame . What's good is to see the contrast in wheel size. I actually got my PS skates today and won't even open the box. I can't go smaller wheels on beach. Is there some lateral adjustment(oval hole?) for centering...or is it just a simple hole ? Should be a nicer set up when done with a nicer fit. You are correct, there is a gap up front. 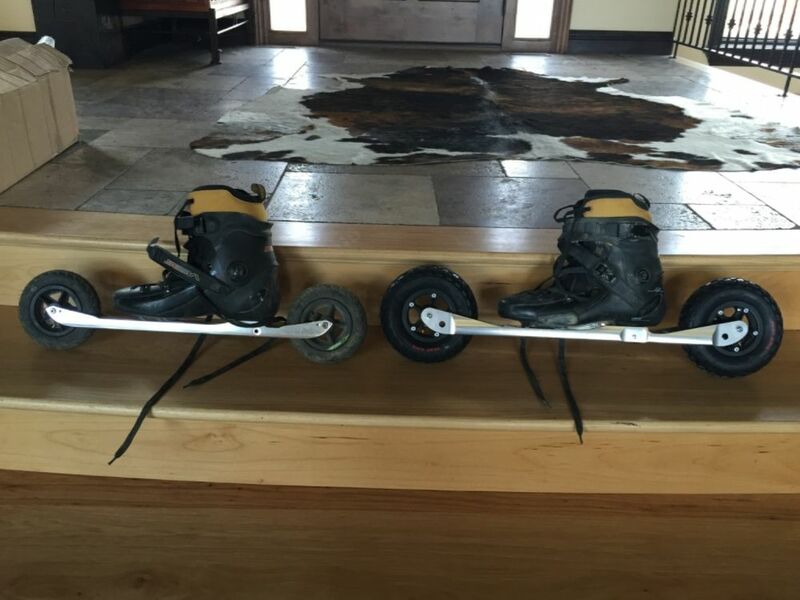 The Seba boots are set up for a "zero drop" flat set up front to back while the Rollerblades had a drop to the boot so the frame is built up in the back relative to the front. I like the idea of getting some flat aluminum tubing so I'll try and go that way first. Regretfully, I would think that the narrow 125mm wheels on the SUVs might sink in a bit in sand unless it was really hard and compacted. This skate setup for beach or lush grass is a tough nut to crack IMHO. 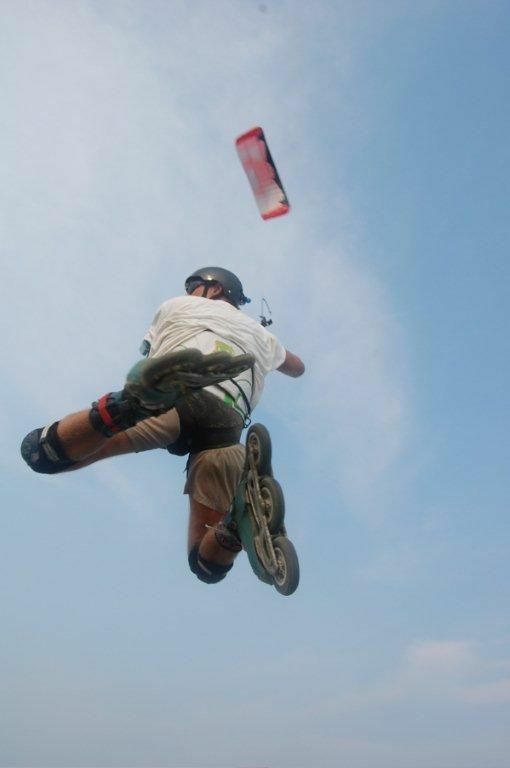 On the XK forum are many kite skate threads going back to 2009. Folks interested in this topic might want to pursue that as well. The Down Under guys have also wrestled with this problem. A lot of them went with various forms of Wheels of Doom setups (giant wheels on frames putting the wheels in front and back of the foot with ski boots). Gotta say they look like leg breakers. I'm sure they'd roll well on low tide sand and lush grass but they look hard to turn and Lord help you if you do a twisting fall under load. I'd love to hear from folks that have made setups work other than Wheels of Doom set ups. There used to be "Terrablades" out there - now those were beasts! Yes, there are some slots on the bottom of both the SUV and Coyote frames. I'll get some pictures up by and by. You Should revisit this size option using two wheels..
You have a more difficult surface than hard pack beach sand. Wheel base slightly longer.... by 4"
I agree! I have called Doom style wheels leg breakers since I 1st saw them. There are a few stories way back of them doing exactly that. The thing with them and Maybe the big wheel set-up Skim' shows is top end speed! For me Coyotes small wheels get squirrely at about 40mph.. If I was to build wheels of Doom it would be ( have been ) for speed. The extra weight of ski bindings wouldn't be such an issue if you just want to go straight at 50mph. + ! I have looked at your "Monster Truck" set up a number of times in this photo and thought about going there if the three stock 150mm wheels don't cut it for my grass fields. Too early to tell because Spring hasn't sprung here yet and the grass is still dormant. Taking a look at the frames yesterday I was having a hard time picturing how the 200mm wheels were going to fit even with removing the middle wheel. If I get there I may be messaging you for more detailed information. It looks to me at first glance that you'd have to cut some of the actual structure out of the frame to make room. Cross that bridge if I get to it! I removed the braking mechanism. This setup features 150mm pneumatic tires more or less akin to the ones on the Coyotes. I was planning on trying all three setups down at IBX on the playa to get a feel for pros and cons of each setup. All this talk of 40-50 mph skating is outside of my comfort zone. I wouldn't say I'm a mellow cruiser but I'm no wind-screaming-in-your-helmet kiter either. I've just gotten too crash-adverse for all that. As I've gotten older (now mid-50's) it is taking so incredibly long to recover from injuries that I just want to avoid them or at least really control the risk. I know I'm writing this in a discussion about kite skating! hey Windstruck , Skimt's hack is good direction for sure, taller platform, but very nice with those wheels for speed and durability. you would have to open the frame some for it to fit. 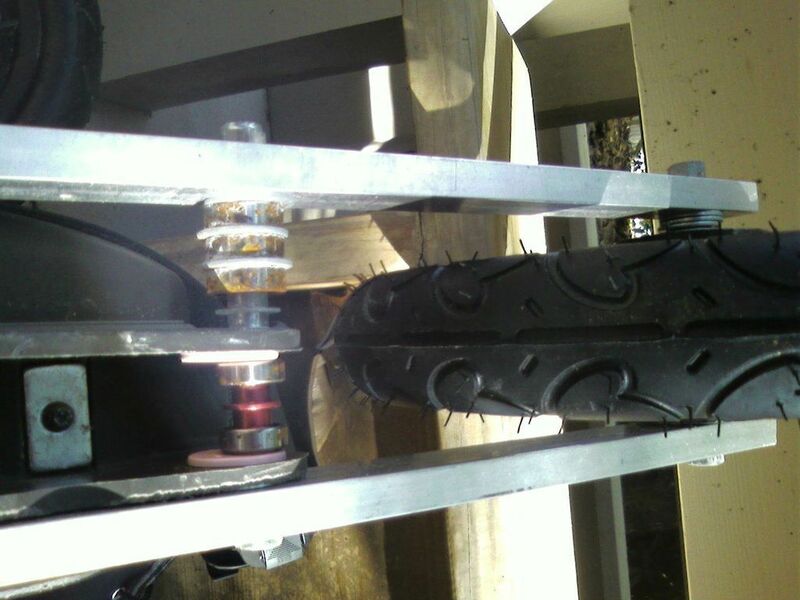 the doom wheel version with ATB 8"/9" tires is great option, on my setup i shortened wheelbase to close to the boot as possible and makes for very tough, jump ready, nimble set up that is truely all terrain, the tire WIDTH gives much better float on varied surfaces. Those sound interesting! I'm sure you've done this before, but would you mind kindly re-posting some photos? Thanks in advance! heres the 8" on same rails , just moved in close to boot, really fun, plenty fast and same tires/wheels/bearings as ATB in 8" or 9". hands down best of all the skate elements without the flats! really tough vert.skate boots, nice low platform, slide easy, jump, rotate easy all the way around handling. skate boot/frame has NO alteration , rails just bolt right on existing frame, and a an image of spacer set up which the bearing/spacers that would be in the frames anyway. the offset was mostly for the 12". you don't need the offset for 8" it can be even set up front to rear. Those look fantastic Phree! Thanks for taking the time to post the pics. I'm going to have to see where all this takes me. The last thing in the world I want to do is tear some knee ligaments (or worse) chasing my kites around. With the wheels underfoot as I have them now I can "carve" my turns at the end of the run as compared to having to step turn as it seems one pretty much has to do with setups like these with two larger wheels placed in front of and behind the boot. I do like how this general approach lowers the center of gravity, so like everything in life, these designs have their trade offs. While I could be completely wrong about this, in general I feel better about my knee health with the wheels under my feet than next to them. Next steps for me are to experiment with my three existing frame sets at IBX then see how they all work in lush grass once things start growing around here. Fun little project to noodle around with! Wearing your undies on the outside (again). Outstanding! Thanks to Phreerider for properly abbreviating my name to 'Skimt'(as in ski Mt. Washington) .... instead of 'Skim'. I don't 'skim' ....but I do ski...and ski mountains. Your doom set ups- on initially look- seem a little too long a wheel base.... but you say not too bad. Still not the maneuverability of standard Coyotes anyway. Perhaps better than some I've seen though. 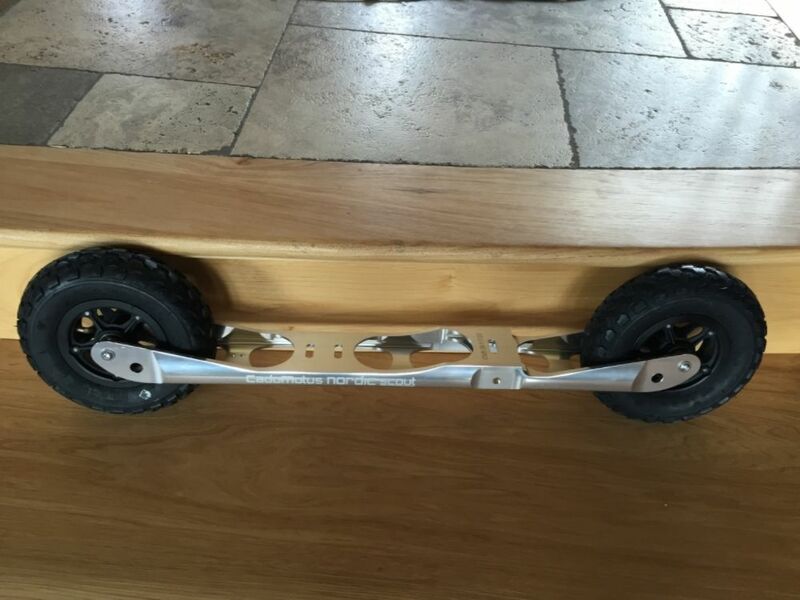 Seems the options are to either lower the base/center of gravity with a longer wheel base, or shorten the wheel base by raising the boot high enough with a frame that allows wheels to be under( or partially -as much as the wheels clear each other) the boot. The latter will allow quicker turns or better 'carving'. But too high a COG(from too big a wheel underneath) may mean loss of some stability. So Ken, you're suggesting the two 200mm wheels would be more stable at high(est) speed then? Steve, you are looking for less rolling resistance and 'float' through/over the grass...which may or may not come with a loss of stability with the bigger 200mm wheels. In catchy, roll resistant grasses, smaller wheels 'bogging down' in grass and resisting, will be more unbalancing/unstable I'm thinking. I can't see a grassy surface being a place for attaining such high speeds(40 mph ), anyway. Beach hardpack...sure! right on! the doom wheels in general are very much "ski like" the 8" shortens and lowers things and just made things better. the coyoytes definitely the most nimble of the group but the tires not suitable for me, a bigger guy, to be jumping all the time. i have ridden on grass and the more tire, the better! esp. width, like 9" ATB . high speed on grass, hmmm ...considerable education in numerous dimensions. I have something similar to these that I've been meaning to try out on the lakebed. Afraid I'll fall on my a$$ but figure it's worth a try. I'm not sure how well they will work, they've got slightly smaller yet wider hard plastic wheels compared to the Coyotes. Trying to remember what they are though. Will dig up a pic if I can find it. The evolution continues! I got longer bolts today (5/16"-18 x 3/4" (rear); 5/16"-18 x 1" (front)) along with some 1/2" x 2" wood to make some shims to support the front of the skate boots to make up for the roughly 1/2" drop from front to back in the frames. Everything is all set now for final assembly and maiden voyages at IBX in about 10 days. Locked and loaded! Oh, and my bad, Skimt, I know I've called you "Skim" before. I don't know how many times I've seen your Username and never figured that out - duh. I thought you were a kid in his 40's. Please try and get a GPS for IBX! I have a strong feeling you will shortly find 35mph actually feels comfortable and safe. A respectable cruising speed even in a buggy. I wish I had the spare cash and time to try out a longer wheel base and bigger wheels on the dry lake. I will be extremely interested in what you find. I mention 50mph because that is Bob Childs top speed. Not mine. Actually in my little mind 3 things effected my top end speeds. the small unbalanced wheels go squirrely. I lose trust in the traction. The shorter wheel base probably compromises stability at that speed. That compromised stability combined with old age likely holds me back? I am pretty certain that the long wheel base and large wheels that Bob used made those extra 10mph much more smooth and stable? I am not at all certain that 2 larger wheels on the Coyote wheel base will give that extra stability. I almost doubt that it will help with feeling more stable at high speed since they aren't really much longer? Curious though! I have been glad more than once that having 6 wheels meant I still have 5 after a blow out! When using blades on the dry lake I have actually been most scared when in slow motion or trying to land / launch my kite. While in motion with so much room down wind dealing with gusts feels much safer? Got my Nordic Scouts from Germany today! I am supremely pleased with the quality and workmanship; the best I've seen to date for things of this sort. The aluminum was clearly CNC'ed from nice billets the wheels are aluminum and look to be very well constructed, and the tires are beefy and knobby, just what the doctor ordered! I'm excited to say the least to try these guys out under some DP kites, complete with a helmet and all the "plastic courage" I can put on my body. 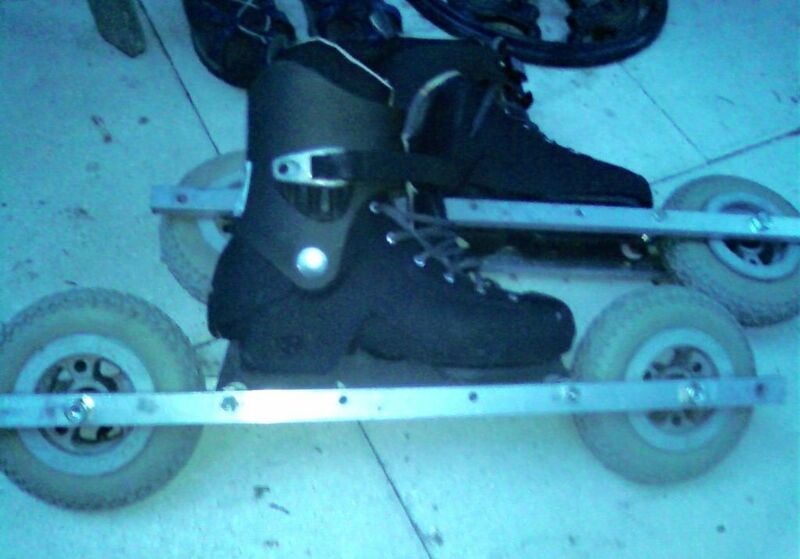 For contrast, the picture of the two skates are the Powerslides on the left and the Nordic Scouts on the right. Powerslide tires are 150x25mm while the Nordic Scouts are 200x50mm. I'm not sure if the picture does the big wheels justice! cool ! 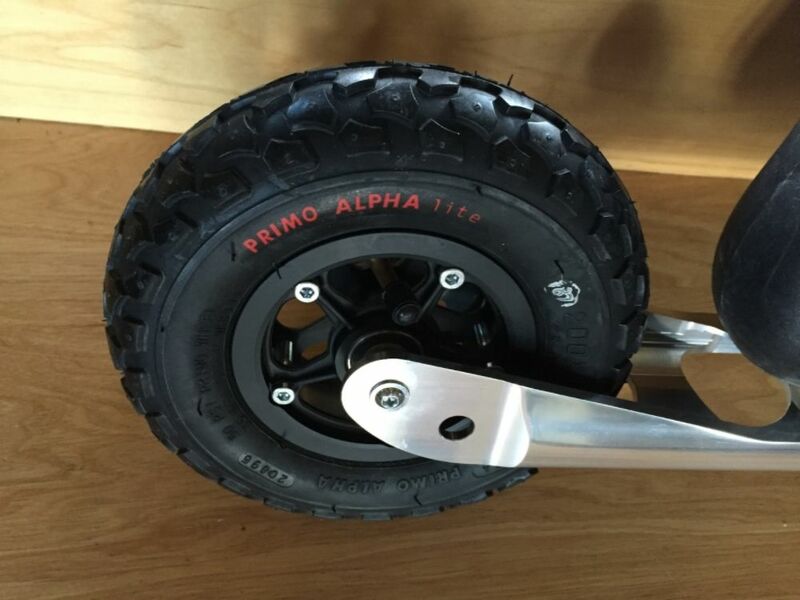 the 200x 50 will float over grass so much easier, its the same as ATB tire/wheel/bearings . Thanks buddy! I haven't weighed them but they were lighter than I expected. Aircraft quality aluminum frames and wheels and quite a bit of open space in the frames. I'm not planning to do much (intentional) jumping so I'm hot too concerned about weight. What I need to be is concerned about my own weight. I made a minor but important improvement today to my Nordic Scout / Seba boot interface. I had been running a single bolt front and back into the center holes on the boots and in the center of the horizontal slots on the frames. I shifted the boots back on the frames a few millimeters to allow for two bolts both front and back. I've got photos higher up in this thread that will hopefully make clear what I did. Four on the floor like this is really solid. I kiteskated today under some good power and they felt really good! If anything biasing the boots back a few millimeters from centered between the wheels improved handling. This kiteskating is a little bit of alright! 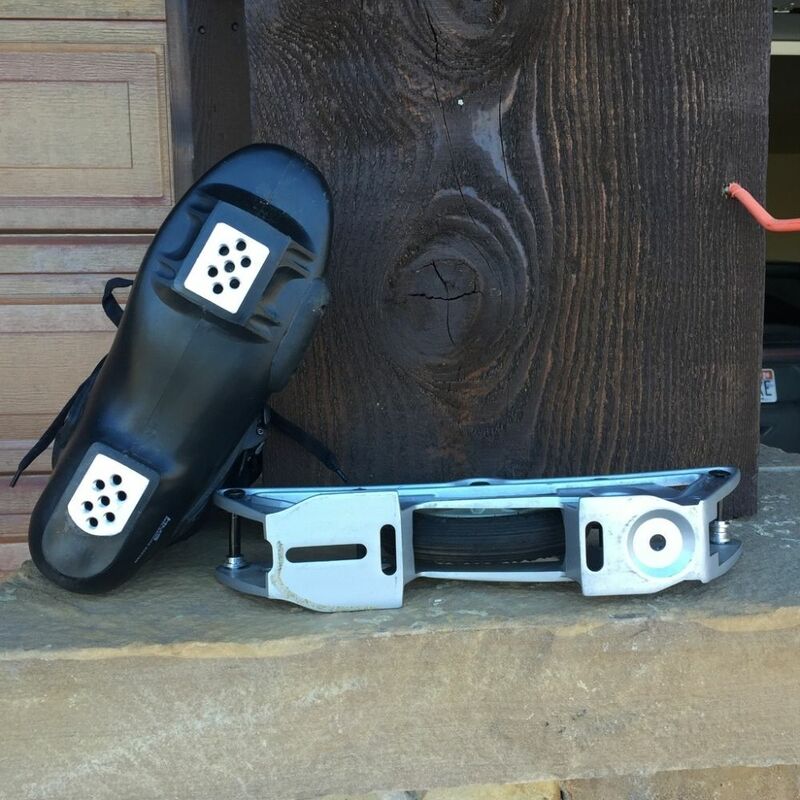 My friend and kiter ('Doneski'on PKF) just got some Coyote Rollerblades recently and decided to make some improvements, even though nothing was broken (yet). Middle Velcro strap and slotted wire combo that ran behind heel has been removed, which was almost useless and took gargantuan strength and odd leverage to try and tighten. Now with TWO (instead of one)easier release buckles and a real power strap. He's thinking of even adding a 3rd buckle lower down and get rid of laces, which are hardly needed now with the 2nd buckle. Looks great as is. Good job! 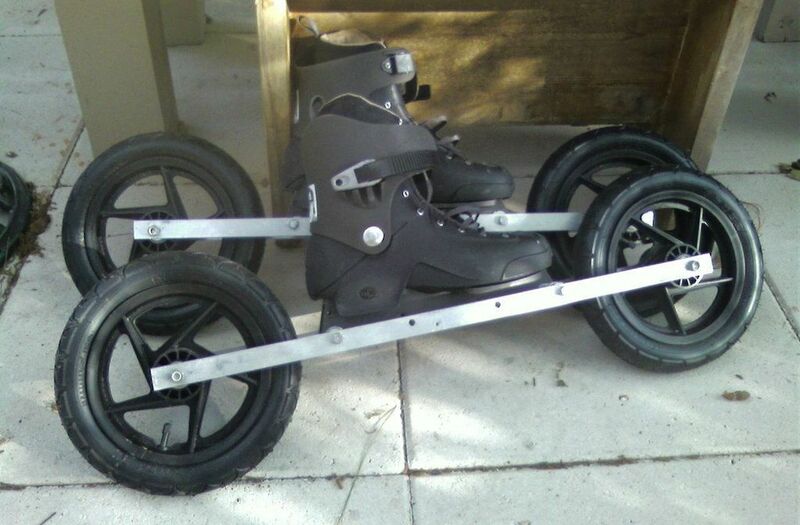 My friend and kiter ('DonesS-P-A-M-L-I-N-K-on PKF) just got some Coyote Rollerblades recently and decided to make some improvements, even though nothing was broken (yet). Tuck, those are superb upgrades! I completely agree that scraping the laces and going with a third lower buckle would be the way to go since Donesk clearly has the prowess to pull it off. The Coyote boots are fairly rigid plastic and I doubt the laces do much of anything at this point now that the vastly improved instep buckle is in place. Something else for Donesk to consider overhauling would be the bearings. I'm not thrilled with the bearings seated in my Coyote wheels. If I were using my Coyote set up with any regularity I'd upgrade those. Pretty cheap investment for a nice improvement IMHO. These little futzing around projects are a lot of simple fun!